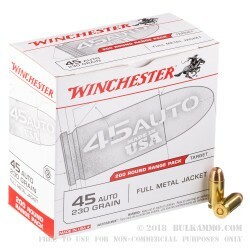 Pick up this 600-round case for some real bulk savings on .45 ACP ammunition! 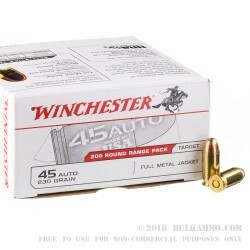 These Winchester "white box" cartridges deliver inexpensive trigger time without sacrificing performance. Each cartridge in this case fires a 230gr. FMJ bullet at 830 feet per second, producing typical ballistics for the .45 Auto. Winchester ammunition is made in the USA using high quality components including non-corrosive Boxer primers and brass cases. Pick up a case today and take your 1911 or other .45 pistol to the range! 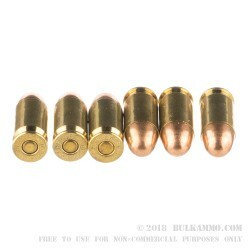 This is my 2nd order from Bulk Ammo. In both cases the ammunition arrived within 2 days and was less expensive per round (delivered) than anyplace else I found. Thanks got my ammo today..